You may not actually know who’s playing in the US Open, but here’s the one thing you absolutely need to know if you’re heading to the USTA Billie Jean King National Tennis Center in the next week: what to eat. Celebrity chefs from around the country, including David Chang and Masaharu Morimoto, have brought out their best dishes to satiate sports fans -- or attendees just in it for the food, we get it -- at the US Open this year. We’ve rounded up the food you can’t miss, including some dishes that are exclusive to the tournament. Just don’t stain your tennis whites while getting your perfect shot for that #TasteOfTheOpen caption. David Chang’s fried chicken sensation has of course made its way to the Open, after becoming the sports snack of the year at both Madison Square Garden and CitiField. 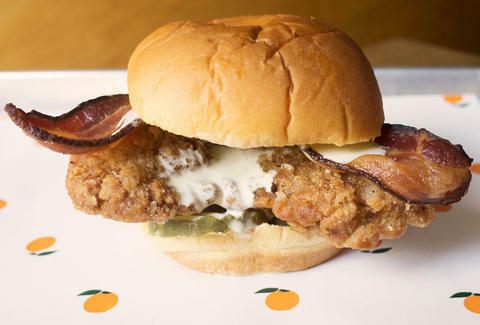 In honor of athleticism and all things healthy, the Fuku sandwich is being graced with applewood-smoked bacon for the very first time for the special Bacon-Ranch Fried Chicken Fuku Sandwich, named after some guy named John McEnroe. Load up on carbs like an athlete with pasta by chef Tony Mantuano of Chicago’s Spiaggia, who President Obama casually called his favorite chef. The rich guanciale- and tomato sauce-coated penne and the lighter fusilli with shrimp, tomatoes, and mozzarella are both excellent made-to-order options and will give you a presidential boost of confidence even if your tickets are absolutely nowhere near the celebrity seating areas. You can also grab a sgroppino here, aka the classier Italian version of a wine slushie made with vodka, rum, or prosecco poured over fruit sorbet. As the first all-vegetarian US Open dining spot, SoomSoom is bringing farm-to-table Mediterranean food that even meat-lovers will enjoy. Case in point, the Soom Sandwich: a pita stuffed with mesclun, cucumbers, tomato, cabbage salad, and falafel balls (all to be dunked in tahini). The Korean-Mexican mash-up has made its way to the Open with customizable rice bowls made with bulgogi, spicy pork, hot chicken thighs, or organic tofu, and topped with things like caramelized kimchee or fire-roasted corn. Tacos, dumplings, and kimchee fries are all on the menu, too. When you think about sporting event-friendly food, you probably think of messy subs sooner than tapas. But this is tennis, where things are a little more refined, which means you’re getting tapas from Meatpacking District favorite Toro, along with refreshing pours of sparkling Spanish cava. Small dishes include chilled shrimp coctel de Cameron, patatas bravas with aioli and spicy tomato sauce, jamon serrano, and hamburguesas: grass-fed mini burgers with smoked tomato, aioli, and pickled red onion... which is basically a fancier version of a sub? New to the open this year is Oyster Bar, where you can slurp local oysters on the half shell and treat yourself to other seafood delights. Pair whatever you get with a glass of bubbly from the nearby Moët & Chandon Terrace, and you’re doing tennis right. You’ll have to judge for yourself whether this frank is actually the Roger Federer or Serena Williams of tube meat, but this is a sporting event and you do therefore deserve a ketchup- and mustard-soaked hot dog. If you want to take it up a notch, New York’s beloved meat purveyor is also serving a filet mignon sandwich as well as a meatball sub. Watching sports can be exhausting! Maybe even as exhausting as playing! (This is probably untrue, but it’s a good excuse to eat a pizza all to yourself.). Neapolitan Express’ reviving A Diavolo pizza is topped with San Marzano tomato sauce, fresh mozzarella, jalapeños, spicy soppressata, salami, and Mike’s hot honey. It would also not be the worst decision to get a Nutella pizza for dessert. Of course the US Open has its own signature cocktail. Adorned with skewered orbs of honeydew that look almost like tennis balls, this vodka cocktail is mixed with lemonade and raspberry liqueur and is indeed the refreshing sip you’ll crave while watching outdoor tennis. Bonus: you can keep the souvenir glass. More than 275,000 melon balls are said to be served at the Open each year. Get drinking to help beat that record.